I just had a cigar so good that I had to write about it. I used to be a regular cigar smoker but that sort of fell by the wayside. I have been trying to get back into the godly habit by having a cigar every month or so. And I just had a great one. 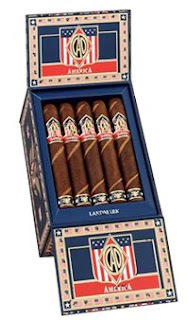 It is a new cigar from CAO called America. The particular one I got was the Potomac, their name for the America that is 5 x 56 in size. The look of this cigar is what made me want it. It is really neat looking. It is made with two different colored wrappers. The main one is a dark brown, but then there is a layering of a light brown that spirals around it. Just really neat. Just see the attached picture. Now, the look alone wasn't the determining factor. If it had been a neat looking Helix, for example (which tastes terrible), I wouldn't have purchased it. But I like CAO and have never had a bad CAO cigar. But the neat look combined with the trustworthy name cinched the deal for me. And the price wasn't bad at all. I don't remember how much I paid, but I am sure it was less than $7. Maybe around $6. CAO has always been good on price. Other brands that taste as good are often much more expensive. The CAO website describes this cigar as full-bodied. I've never been good at determining that sort of thing myself, because it is a rather subjective determination, but I will go with that. It was full-bodied (certainly full of flavor!) but it didn't make me sick to my stomach, as full-bodied cigars often do, especially if I haven't smoked any cigars in a while, which is the case now. But the flavor! Oh wow! It was very cedary and almost sweet. In fact, when the wind would blow the smoke back in my face, I thought it smelled like Drew Estate's Kahlua cigars. There was no harshness or bitterness to it at all. You know how good smelling things often smell better than they taste? For instance, I put sugar in my coffee to make it taste the way it smells. Candles taste terrible. And sometimes cigars just don't taste as great as they smell. But this tasted great in every way. Not a negative drop of smoke touched my tongue. And if you are patient and skinny-fingered enough to let it burn to the last half-inch, then you get the best taste. Pure, straight-on flavor. My my my. I recommend that you buy yourselves a box of these cigars, invite me over and give me some, and we can smoke and talk theology. That is, after, what Heaven will be like. I cannot wait to have one. I will be there in December and it would be a great Christmas present, every positive drop.